PA 1929 $10 ♚♚PORT ALLEGANY,PENNSYLVANIA♚♚ HARD TO FIND!!! 1929 $20 Ty 1 OXFORD, Pennsylvania Charter # 2906 "SCROLL DOWN FOR SCANS"
IA 1929 $10 ♚♚ PRESCOTT, IOWA ♚♚ HARD TO FIND!!! 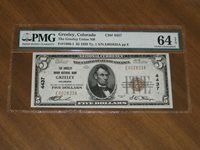 Braddock, PA, Charter #2828, Series1902, $5.00 Plain Back, 15 Notes Reported! 1902 $5 National - Liberty National Bank Guttenberg NJ Ch.12806 - BEST OFFER!